I love Scotland. 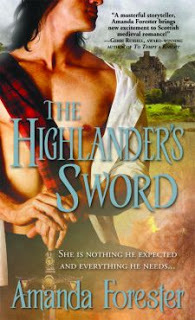 I love the accent, I love the history, and (of course) I love a tall, broad-shouldered, sword-wielding man in a kilt. Does it get any better than that? When I began the research for my current book, The Highlander’s Sword, I started with two ideas. One was that archetypal Highland warrior who occasionally visits me in my dreams. The other was the beginnings of a story line in which a young woman who was promised to the convent, has her world turned upside down when she is married off to a Highlander instead. Now, came the fun part – all the research. I read lots of books, scanned lots of articles on the internet, and was intrigued by the Battle of Neville's Cross in 1346. Let me back up just to set the stage, because I think history is way cool – don’t you? In 1290 the heir to the throne of Scotland died leaving two claimants for the throne, John Balliol and Robert Bruce (grandfather of the future King Robert the Bruce). King Edward I of England agreed to arbitrate who would gain the throne, but at the meeting strong armed the nobles into swearing allegene to him. He chose Balliol as the rightful heir to the throne, but made it clear he viewed Scotland as a vassal state. Thus began the wars for Scottish independence. The Scots fought against English fought for years, with the English finally gaining the Scot surrender after the fall of Stirling and the execution of William Wallace (of Braveheart fame) in 1305. Things were bleak indeed, yet the English were never able to completely subdue the Scots. Robert the Bruce crowned himself king the next year and fought successfully against the English. The Scots were eventually victorious in their struggle in 1328, forcing King Edward III to sign the Treaty of Edinburgh-Northampton, which declared Scotland to be a sovereign nation with Robert the Bruce as king. In 1320 the Scots sent to the Pope the Treaty of Aborath, which declared their independence. In 1346, it became clear to Philip IV of France that England was going to invade in what would later be called the Hundred Year’s War. King Philip begged King David of Scotland to honor the Franco-Scot Auld Alliance and attack England, thus forcing England to fight two wars and take some of the pressure off of France. The Scots, always willing to take up arms against the English, gathered an army of approximately 12,000 men and marched into Northern England in October of 1346. Unfortunately, the English were not as unprepared as they had thought, and after some initial successes the Scots met the English army at Neville’s Cross. Despite outnumbering the English 2-1, the Scots held a poor position and took a defense stance, waiting for the English to attack. The English brought out the Welsh long-bow and harassed the Scot line until they were forced to attack. According to legend, Graham urged the Scots to charge before the bowmen took position shouting, “Give me but a hundred horse and I will scatter them all!” The Scots faltered and the Welsh bowmen were able to get in position. Graham charged but was followed only by his own men and suffered heavy casulties under the longbow. It is this setting that my story begins. I wondered what happened to the Grahams after this devastating loss, and what would happen if a daughter, let’s call her Aila, was left the only surviving heir. Amanda Forester holds a PhD in psychology and worked for many years in academia before discovering that writing historical romance novels was way more fun. She lives in the Pacific Northwest outside Tacoma, Washington with her husband, two energetic children, and one lazy dog. You can visit her at www.amandaforester.com.